Please take a look at my new blog, "Don Gray Prints" to see a selection of reasonably priced Giclee prints from the daily painting project. The prints are archival pigment inks on heavyweight, acid-free art paper. Each print is hand-signed and titled in the lower margin. 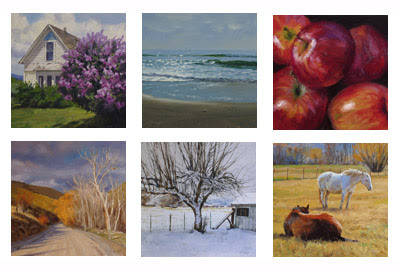 To order in time for Christmas gift-giving, visit http://dongrayprints.blogspot.com/. You chose some good ones to reproduce too. I like the idea of having a separate place just for your giclees. In small scale anyway, that house with the large bush is very beautiful. A wonderful idea and some of my favourites there Don. I think these will look terrific framed. I love the snow scene best. Thanks. I see you've been doing some prints as well--good luck with them. Thanks Bill. Actually, most of my work looks better from a distance. A mile and a half is usually about right. Hi Sheila--thanks for the encouragement! Good combination of apple,snow and home thanks.